Shares are created to make part or all of a pool accessible to other computers on the network. The type of share to create depends on factors like which operating systems are being used by computers on the network, security requirements, and expectations for network transfer speeds. Unix (NFS): Network File System shares are accessible from macOS, Linux, BSD, and the professional and enterprise versions (but not the home editions) of Windows. This can be are a good choice when the client computers do not all run the same operating system but NFS client software is available for all of them. It is generally a mistake to share a pool or dataset with more than one share type or access method. Different types of shares and services use different file locking methods. For example, if the same pool is configured to use both NFS and FTP, NFS will lock a file for editing by an NFS user, but an FTP user can simultaneously edit or delete that file. This results in lost edits and confused users. Another example: if a pool is configured for both AFP and SMB, Windows users can be confused by the “extra” filenames used by Mac files and delete them. This corrupts the files on the AFP share. Pick the one type of share or service that makes the most sense for the types of clients accessing that pool, and use that single type of share or service. To support multiple types of shares, divide the pool into datasets and use one dataset per share. FreeNAS® uses the Netatalk AFP server to share data with Apple systems. This section describes the configuration screen for fine-tuning AFP shares. 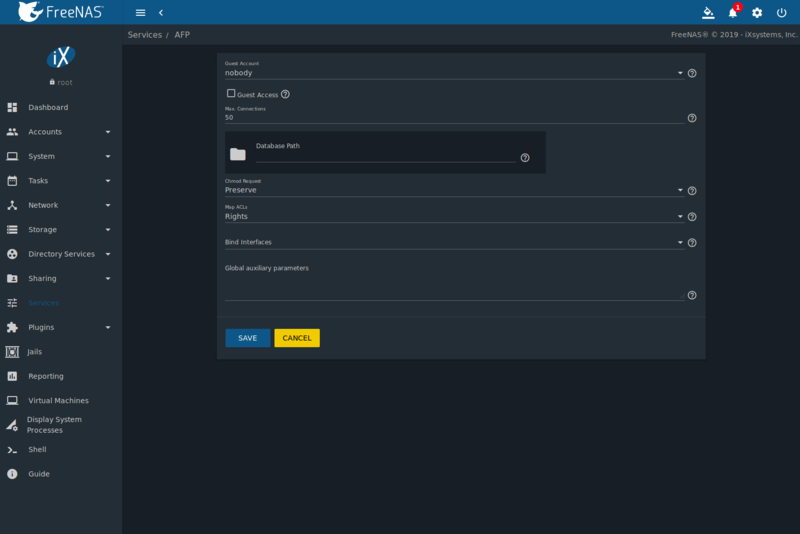 It then provides configuration examples for configuring Time Machine to back up to a dataset on the FreeNAS® system and for connecting to the share from a macOS client. Create a share by clicking Sharing ‣ Apple (AFP), then ADD. New AFP shares are visible in the Sharing ‣ Apple (AFP) menu. The configuration options shown in Figure 11.1.1 appear after clicking  (Options) on an existing share, and selecting the Edit option. The values showing for these options will vary, depending upon the information given when the share was created. Table 11.1.1 summarizes the options available to fine-tune an AFP share. Leaving these options at the default settings is recommended as changing them can cause unexpected behavior. Most settings are only available with Advanced Mode. Do not change an advanced option without fully understanding the function of that option. Refer to Setting up Netatalk for a more detailed explanation of these options. Path browse button Browse to the pool or dataset to share. Do not nest additional pools, datasets, or symbolic links beneath this path because Netatalk does not fully support that. Name string Enter the pool name that appears in macOS after selecting Go ‣ Connect to server in the Finder menu. Limited to 27 characters and cannot contain a period. Comment string ✓ Optional comment. Read Only Access string ✓ Comma-delimited list of users and/or groups who only have read access where groupname begins with a @. Read/Write Access string ✓ Comma-delimited list of users and/or groups who have read and write access where groupname begins with a @. No Stat checkbox ✓ If set, AFP does not stat the pool path when enumerating the pools list. Useful for automounting or pools created by a preexec script. Default file permissions checkboxes ✓ Only works with Unix ACLs. New files created on the share are set with the selected permissions. Default directory permissions checkboxes ✓ Only works with Unix ACLs. New directories created on the share are set with the selected permissions. Auxiliary Parameters string Enter any additional afp.conf parameters not covered by other option fields. Before creating a guest share, go to Services ‣ AFP and click the sliding button to turn on the service. Click  (Configure) to open the screen shown in Figure 11.1.2. For Guest Account, use the drop-down to select Nobody, set Guest Access, and click SAVE. Next, create a dataset for the guest share. Refer to Adding Datasets for more information about dataset creation. After creating the dataset for the guest share, go to Storage ‣ Pools, click the  (Options) button for the dataset, then click Edit Permissions. Complete the fields shown in Figure 11.1.3. User: Use the drop-down to select Nobody. Go to Sharing ‣ Apple (AFP) Shares and click ADD. Browse to the dataset created for the guest share. Fill out the other required fields, then press SAVE. macOS users can use Finder to connect to the guest AFP share by clicking Go ‣ Connect to Server. In the example shown in Figure 11.1.4, the user entered afp:// followed by the IP address of the FreeNAS® system. To disconnect from the pool, click the eject button in the Shared sidebar. Create an NFS share by going to Sharing ‣ Unix (NFS) Shares and clicking ADD. Figure 11.2.1 shows an example of creating an NFS share. Each pool or dataset is considered to be a unique filesystem. Individual NFS shares cannot cross filesystem boundaries. Adding paths to share more directories only works if those directories are within the same filesystem. Path set to the dataset /mnt/pool1/dataset1. An additional path to directory /mnt/pool1/dataset1/directory1 is added. The correct method to configure this share is to set the Path to /mnt/pool1/dataset1 and set the All dirs box. This allows the client to also mount /mnt/pool1/dataset1/directory1 when /mnt/pool1/dataset1 is mounted. Additional paths are used to define specific directories to be shared. For example, dataset1 has three directories. To share only /mnt/pool1/dataset1/directory1 and /mnt/pool1/dataset1/directory2, create paths for directory1 and directory2 within the share. This excludes directory3 from the share. This requires the creation of two shares. It cannot be done with only one share. Table 11.2.1 summarizes the available configuration options in the Sharing/NFS/Add screen. Click ADVANCED MODE to see all settings. Path browse button Browse to the pool, dataset, or directory to be shared. Click Add extra Path to add multiple directories to this share. All dirs checkbox Allow the client to also mount any subdirectories of the selected pool or dataset. Authorized Hosts and IP addresses string ✓ Space-delimited list of allowed IP addresses or hostnames. Leave empty to allow all. Go to Sharing ‣ Unix (NFS) and click  (Options) and Edit to edit an existing share. 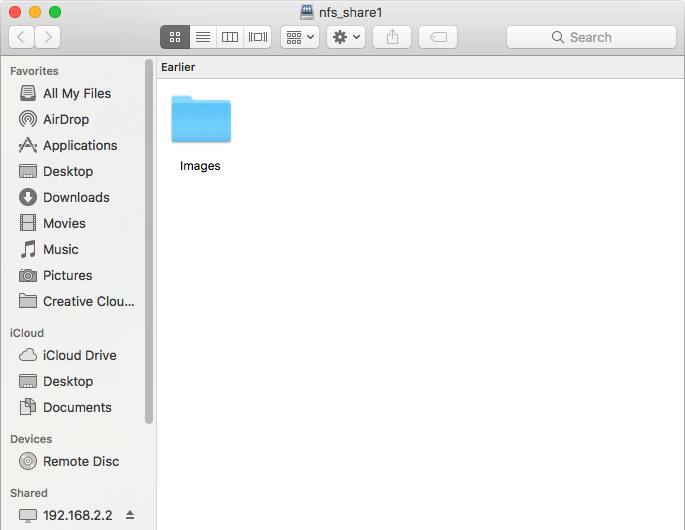 Figure 11.2.2 shows the configuration screen for the existing nfs_share1 share. Options are the same as described in NFS Share Options. In the Change Permissions screen of the pool or dataset that is being shared, change the owner and group to nobody and set the permissions according to the desired requirements. 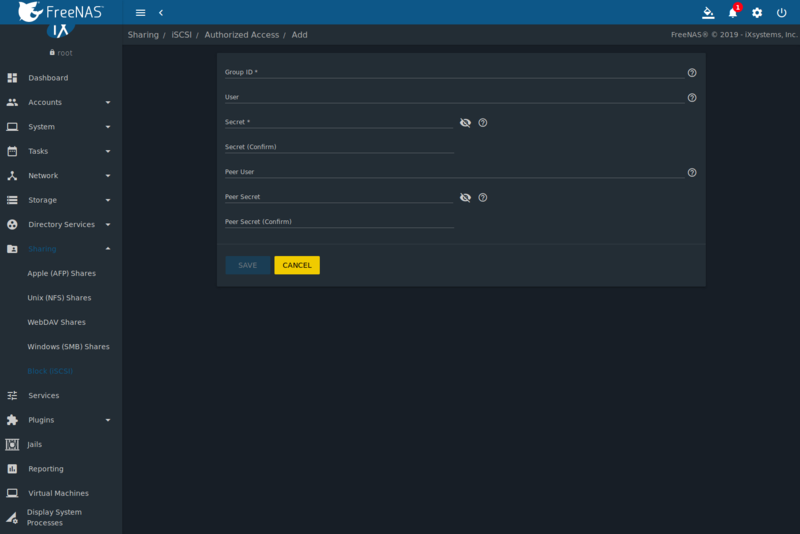 With this configuration, it does not matter which user account connects to the NFS share, as it will be mapped to the nobody user account and will only have the permissions that were specified on the pool or dataset. For example, even if the root user is able to connect, it will not gain root access to the share. A dataset named /mnt/pool1/nfs_share1 is created and the permissions set to the nobody user account and the nobody group. This configuration allows users on the client system to copy files to and from /mnt (the mount point). All files are owned by nobody:nobody. 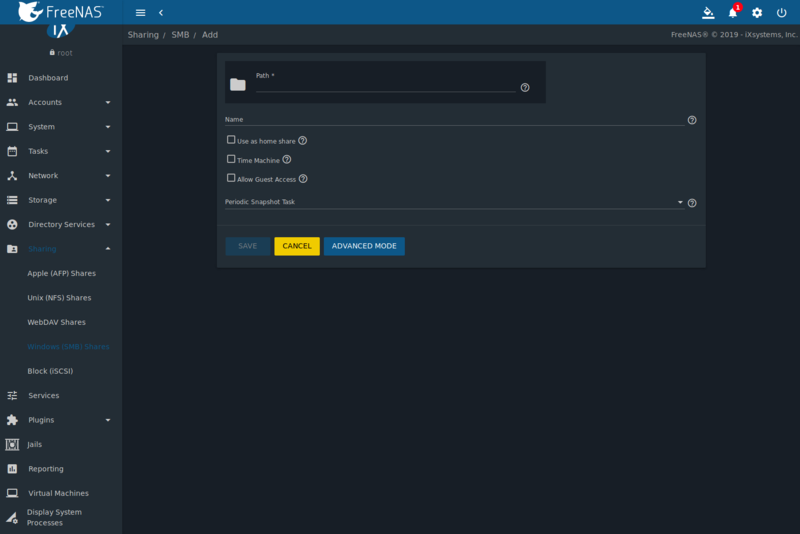 Changes to any files or directories in /mnt write to the FreeNAS® system /mnt/pool1/nfs_share1 dataset. A macOS client uses Finder to mount the NFS volume. Go to Go ‣ Connect to Server. 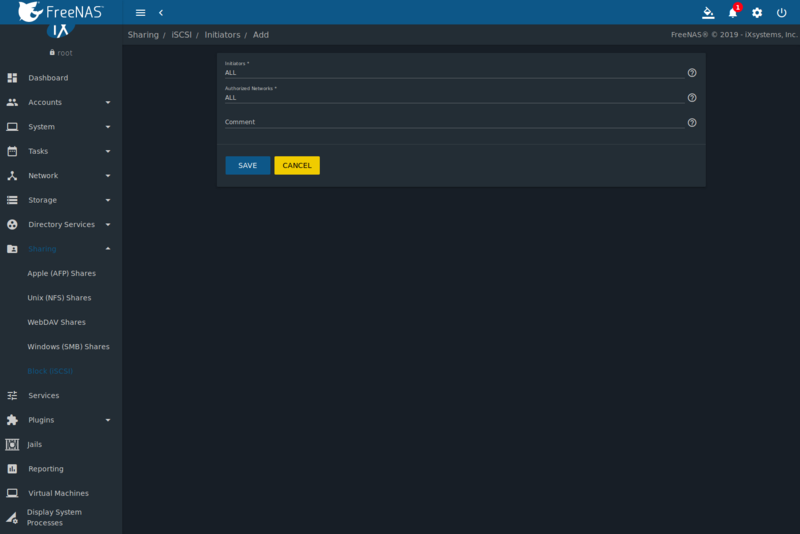 In the Server Address field, enter nfs:// followed by the IP address of the FreeNAS® system, and the name of the pool or dataset being shared by NFS. The example shown in Figure 11.2.3 continues with the example of 192.168.2.2:/mnt/pool1/nfs_share1. Finder opens automatically after connecting. 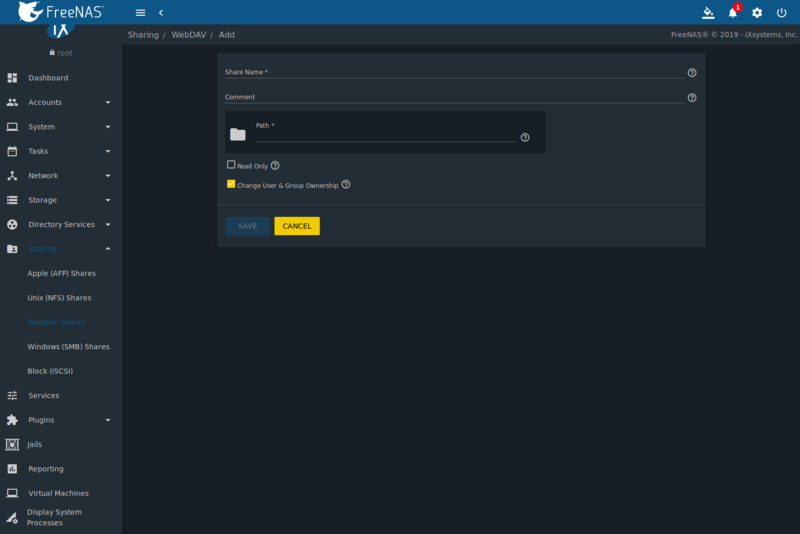 The IP address of the FreeNAS® system displays in the SHARED section of the left frame and the contents of the share display in the right frame. Figure 11.2.4 shows an example where /mnt/data has one folder named images. 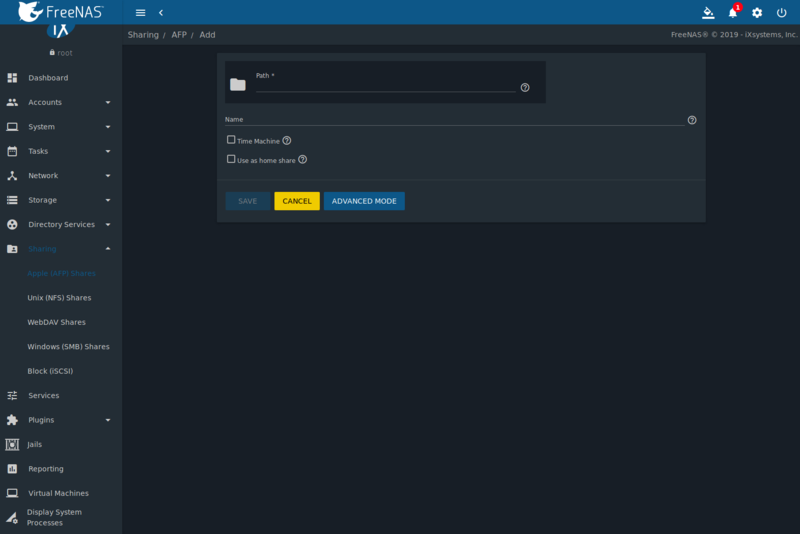 The user can now copy files to and from the share. If clients see “reverse DNS” errors, add the FreeNAS® IP address in the Host name database field of Network ‣ Global Configuration. If clients receive timeout errors when trying to mount the share, add the client IP address and hostname to the Host name database field in Network ‣ Global Configuration. Some older versions of NFS clients default to UDP instead of TCP and do not auto-negotiate for TCP. By default, FreeNAS® uses TCP. 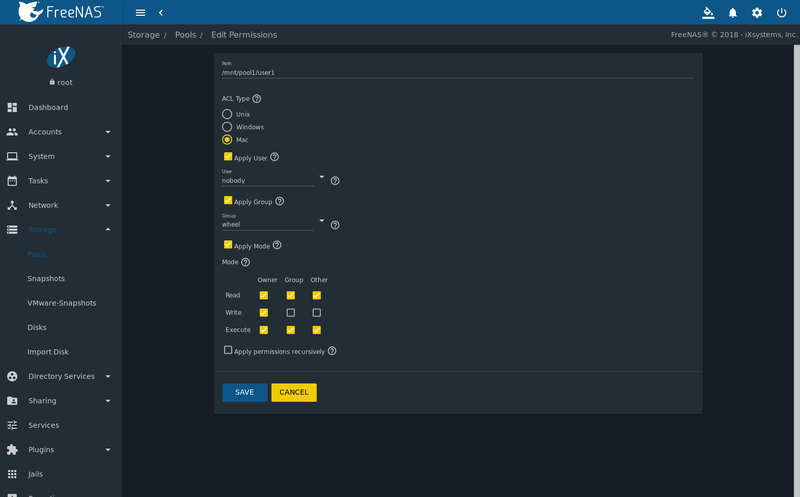 To support UDP connections, go to Services ‣ NFS ‣ Configure and enable the Serve UDP NFS clients option. 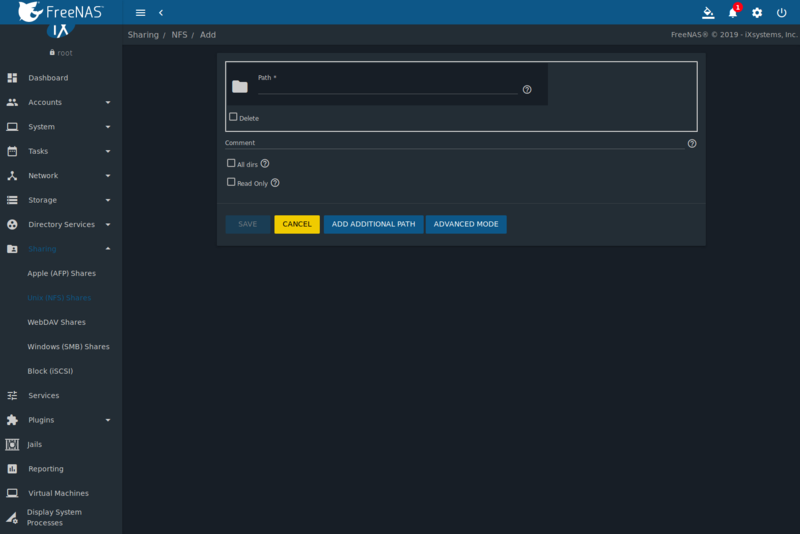 In FreeNAS®, WebDAV shares can be created so that authenticated users can browse the contents of the specified pool, dataset, or directory from a web browser. protocol: is either http or https, depending upon the Protocol configured in Services ‣ WebDAV ‣ CONFIGURE. port_number: is configured in Services ‣ WebDAV ‣ CONFIGURE. 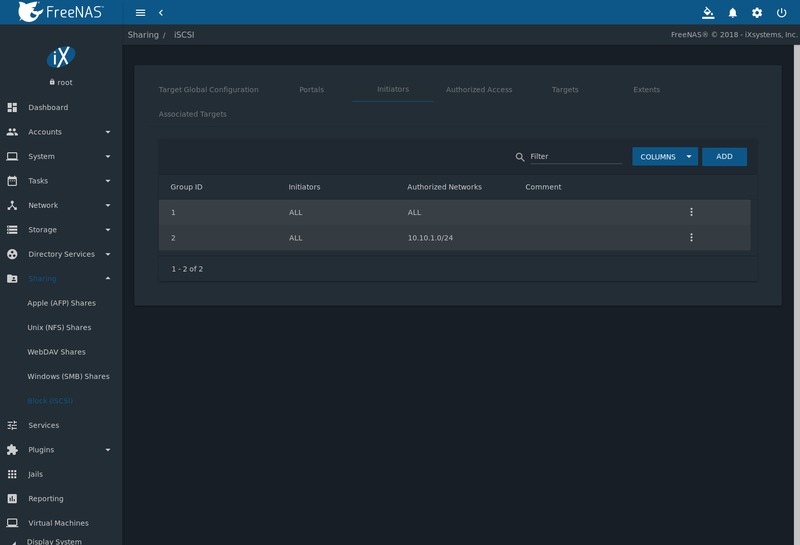 If the FreeNAS® system is to be accessed using a public IP address, consider changing the default port number and ensure that the network firewall only allows access to authorized systems. share_name: is configured by clicking Sharing ‣ WebDAV Shares, then ADD. Entering the URL in a web browser brings up an authentication pop-up message. Enter a username of webdav and the password configured in Services ‣ WebDAV ‣ CONFIGURE. To create a WebDAV share, go to Sharing ‣ WebDAV Shares and click ADD, which will open the screen shown in Figure 11.3.1. Table 11.3.1 summarizes the available options. Share Name string Enter a name for the share. Path browse button Browse to the pool or dataset to share. Click SAVE to create the share. Then, go to Services ‣ WebDAV and click the ⏻ (Power) button to turn on the service. After the service starts, review the settings in Services ‣ WebDAV ‣ CONFIGURE as they are used to determine which URL is used to access the WebDAV share and whether or not authentication is required to access the share. These settings are described in WebDAV. FreeNAS® uses Samba to share pools using Microsoft’s SMB protocol. SMB is built into the Windows and macOS operating systems and most Linux and BSD systems pre-install the Samba client in order to provide support for SMB. If the distro did not, install the Samba client using the distro software repository. SMB1 is disabled by default for security. If necessary, SMB1 can be enabled in Services ‣ SMB Configure. Figure 11.4.1 shows the configuration screen that appears after clicking Sharing ‣ Windows (SMB Shares), then ADD. Table 11.4.1 summarizes the options available when creating a SMB share. Some settings are only configurable after clicking the ADVANCED MODE button. For simple sharing scenarios, ADVANCED MODE options are not needed. For more complex sharing scenarios, only change an ADVANCED MODE option after fully understanding the function of that option. smb.conf(5) provides more details for each configurable option. Path browse button Select the pool, dataset, or directory to share. The same path can be used by more than one share. Time Machine checkbox Enable Time Machine backups for this share. The process to configure a Time Machine backup is shown in Creating Authenticated and Time Machine Shares. Default Permissions checkbox ✓ ACLs grant read and write for owner or group and read-only for others. Leave this unset when creating shares on a system with custom ACLs. Export Read Only checkbox ✓ Prohibit write access to this share. Browsable to Network Clients checkbox ✓ Users see the contents of /home, which includes the home directories of other users. Leave unset for users to only see their own home directory. Export Recycle Bin checkbox ✓ Set for deleted files to move to .recycle in the root folder of the share. The .recycle directory can be deleted to reclaim space and is recreated whenever a file is deleted. Access Based Share Enumeration checkbox ✓ Restrict share visibility to Windows users with a current Windows Share ACL access of read or write. Use Windows administration tools to adjust the share permissions. See smb.conf(5). Hosts Deny string ✓ Enter a list of denied hostnames or IP addresses. Specify ALL and list any hosts from Hosts Allow to have those hosts take precedence. Separate entries with a comma (,), space, or tab. VFS Objects selection ✓ Add virtual file system modules to enhance functionality. Table 11.4.2 summarizes the available modules. Periodic Snapshot Task drop-down menu ✓ Used to configure directory shadow copies on a per-share basis. Select the pre-configured periodic snapshot task to use for the share’s shadow copies. Periodic snapshots must be recursive. Hostname lookups add some time to accessing the SMB share. If only using IP addresses, unset the Hostnames Lookups setting in Services ‣ SMB ‣  (Configure). When the Browsable to Network Clients option is selected, the share is visible through Windows File Explorer or through net view. When the Use as home share option is selected, deselecting the Browsable to Network Clients option hides the share named homes so that only the dynamically generated share containing the authenticated user home directory will be visible. By default, the homes share and the user home directory are both visible. Users are not automatically granted read or write permissions on browsable shares. This option provides no real security because shares that are not visible in Windows File Explorer can still be accessed with a UNC path. If some files on a shared pool should be hidden and inaccessible to users, put a veto files= line in the Auxiliary Parameters field. The syntax for the veto files option and some examples can be found in the smb.conf manual page. Samba disables NTLMv1 authentication by default for security. Standard configurations of Windows XP and some configurations of later clients like Windows 7 will not be able to connect with NTLMv1 disabled. Security guidance for NTLMv1 and LM network authentication has information about the security implications and ways to enable NTLMv2 on those clients. If changing the client configuration is not possible, NTLMv1 authentication can be enabled by selecting the NTLMv1 auth option in Services ‣ SMB ‣  (Configure). Table 11.4.2 provides an overview of the available VFS modules. Be sure to research each module before adding or deleting it from the Selected column of the VFS Objects field of the share. Some modules need additional configuration after they are added. Refer to Stackable VFS modules and the vfs_* man pages for more details. shadow_copy Allow Microsoft shadow copy clients to browse shadow copies on Windows shares. streams_depot Experimental module to store alternate data streams in a central directory. The association with the primary file can be lost due to inode numbers changing when a directory is copied to a new location. See https://marc.info/?l=samba&m=132542069802160&w=2>. Go to Sharing ‣ Windows (SMB) Shares and click ADD. Fill out the the fields as shown in Figure 11.4.2. Enable the Allow guest access option. If a dataset for the share has not been created, refer to Adding Datasets to find out more about dataset creation. The new share appears in Sharing ‣ Windows (SMB) Shares. Before creating an authenticated SMB share, go to Storage ‣ Pools to make a dataset for the share. For more information about dataset creation, refer to Adding Datasets. After creating the dataset, go to Storage ‣ Pools and click the  (Options) button for the desired dataset. Click Edit Permissions and fill out the information as shown in Figure 11.4.3. User: If the user does not yet exist on the FreeNAS® system, go to Accounts ‣ Users to create one. Refer to Users for more information about creating a user. After the user has been created, use the drop-down to select the user account. Group: Use the drop-down to select the desired group name. 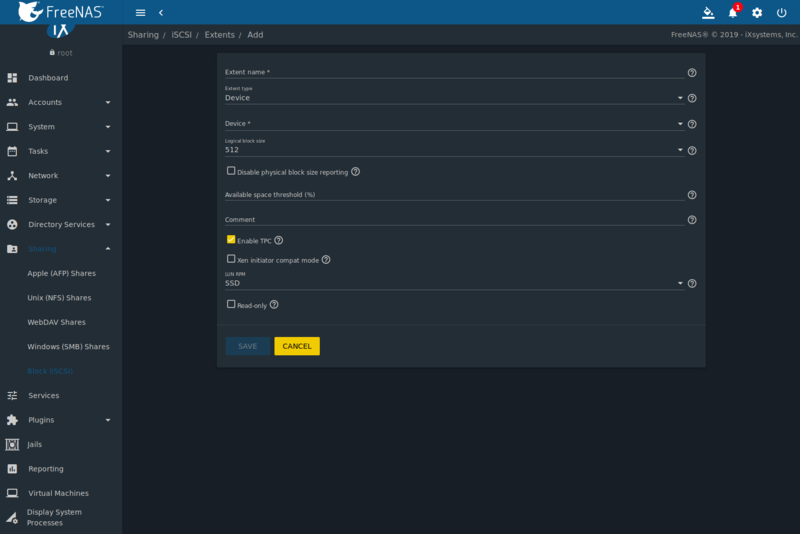 If the group does not yet exist on the FreeNAS® system, go to Accounts ‣ Groups to create one. Refer to Groups for more information about creating a group. To create an authenticated SMB share, go to Sharing ‣ Windows (SMB) Shares and click ADD, as shown in Figure 11.4.4. Browse to the dataset created for the share and enter a name for the share. Press SAVE to create the share. To configure multiple authenticated shares, repeat for each user. The new shares are also added to Sharing ‣ Windows (SMB) Shares. The next time a share is accessed with Explorer, a prompt to authenticate appears. When a periodic snapshot task is created on a ZFS pool that is configured as a SMB share in FreeNAS®, it is automatically configured to support shadow copies. If the Windows system is not fully patched to the latest service pack, Shadow Copies may not work. If no previous versions of files to restore are visible, use Windows Update to ensure the system is fully up-to-date. Shadow copy support only works for ZFS pools or datasets. This means that the SMB share must be configured on a pool or dataset, not on a directory. The periodic snapshot task should be created and at least one snapshot should exist before creating the SMB share. If the SMB share was created first, restart the SMB service in Services. Appropriate permissions must be configured on the pool or dataset being shared by SMB. Users cannot delete shadow copies on the Windows system due to the way Samba works. 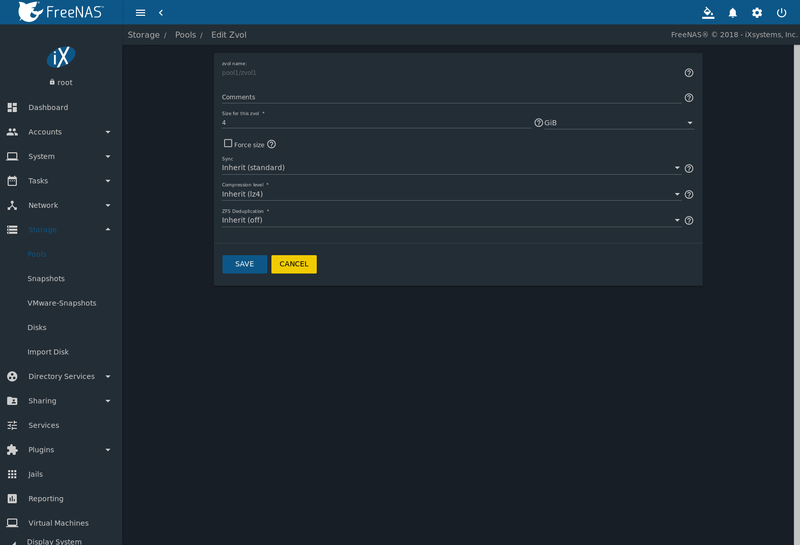 Instead, the administrator can remove snapshots from the FreeNAS® web interface. The only way to disable shadow copies completely is to remove the periodic snapshot task and delete all snapshots associated with the SMB share. Go to Tasks ‣ Periodic Snapshot Tasks and click ADD to create at least one periodic snapshot task. There are two options for snapshot tasks. One is to create a snapshot task for each user’s dataset. In this example the datasets are /mnt/volume1/user1 and /mnt/volume1/user2. Another option is to create one periodic snapshot task for the entire volume, /mnt/volume1 in this case. Before continuing to the next step, confirm that at least one snapshot for each defined task is displayed in the Storage ‣ Snapshots tab. When creating the schedule for the periodic snapshot tasks, keep in mind how often the users need to access modified files and during which days and time of day they are likely to make changes. Go to Sharing ‣ Windows (SMB) Shares and click  (Options) on an existing share. Click Edit then ADVANCED MODE. Use the Periodic Snapshot Task drop-down menu to select the periodic snapshot task to use for that share. Repeat for each share being configured as a shadow copy. For this example, the share named /mnt/pool1/user1 is configured to use a periodic snapshot task that was configured to take snapshots of the /mnt/pool1/user1 dataset and the share named /mnt/pool1/user2 is configured to use a periodic snapshot task that was configured to take snapshots of the /mnt/pool1/user2 dataset. Verify that the SMB service is running in Services. Figure 11.4.5 provides an example of using shadow copies while logged in as user1 on the Windows system. 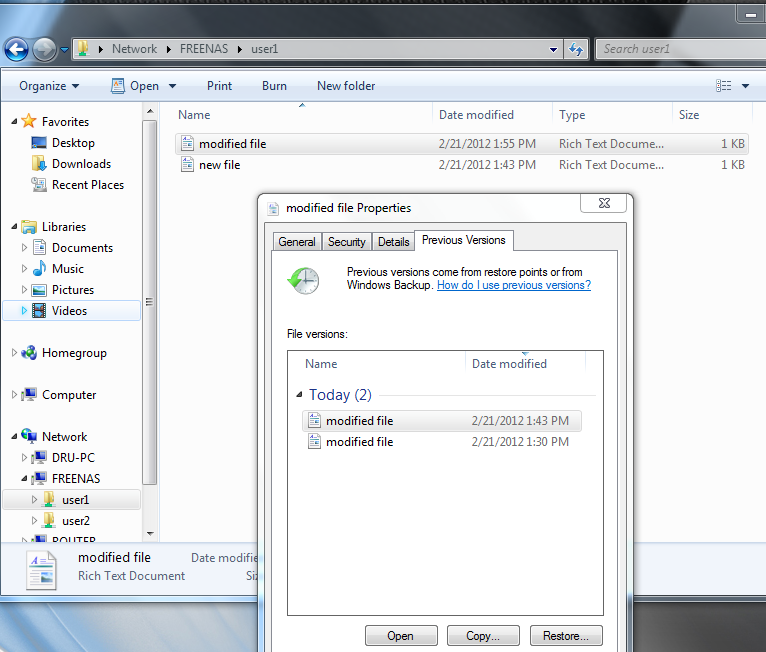 In this example, the user right-clicked modified file and selected Restore previous versions from the menu. This particular file has three versions: the current version, plus two previous versions stored on the FreeNAS® system. The user can choose to open one of the previous versions, copy a previous version to the current folder, or restore one of the previous versions, overwriting the existing file on the Windows system. In FreeNAS®, iSCSI is built into the kernel. This version of iSCSI supports Microsoft Offloaded Data Transfer (ODX), meaning that file copies happen locally, rather than over the network. 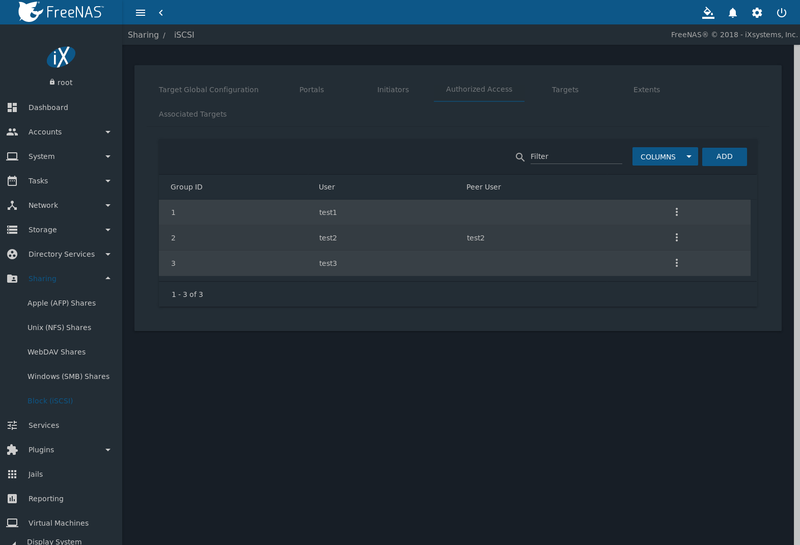 It also supports the VAAI (vStorage APIs for Array Integration) primitives for efficient operation of storage tasks directly on the NAS. To take advantage of the VAAI primitives, create a zvol using the instructions in Adding Zvols and use it to create a device extent, as described in Extents. Start the iSCSI service in Services. Sharing ‣ Block (iSCSI) ‣ Target Global Configuration, shown in Figure 11.5.1, contains settings that apply to all iSCSI shares. Table 11.5.1 summarizes the settings that are configured in the Target Global Configuration screen. A portal specifies the IP address and port number to be used for iSCSI connections. Go to Sharing ‣ Block (iSCSI) ‣ Portals and click ADD to display the screen shown in Figure 11.5.2. Table 11.5.2 summarizes the settings that can be configured when adding a portal. To assign additional IP addresses to the portal, click the link Add extra Portal IP. Comment string Enter an optional description. Portals are automatically assigned a numeric group ID. 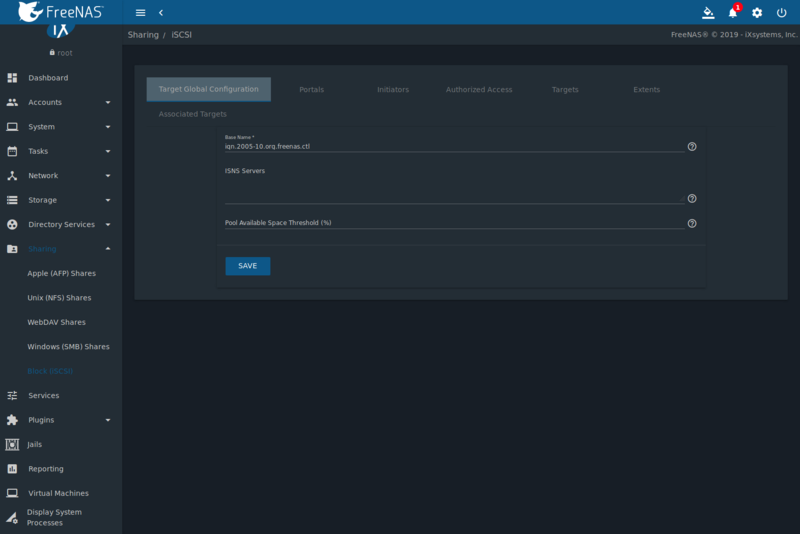 The next step is to configure authorized initiators, or the systems which are allowed to connect to the iSCSI targets on the FreeNAS® system. To configure which systems can connect, go to Sharing ‣ Block (iSCSI) ‣ Initiators and click ADD as shown in Figure 11.5.3. Table 11.5.3 summarizes the settings that can be configured when adding an initiator. Authorized Networks string Network addresses that can use this initiator. Use ALL or list network addresses with a CIDR mask. Separate multiple addresses with a space: 192.168.2.0/24 192.168.2.1/12. In the example shown in Figure 11.5.4, two groups are created. Group 1 allows connections from any initiator on any network. Group 2 allows connections from any initiator on the 10.10.1.0/24 network. Click  (Options) on an initiator entry to display its Edit and Delete buttons. When using CHAP or mutual CHAP to provide authentication, creating an authorized access is recommended. Do this by going to Sharing ‣ Block (iSCSI) ‣ Authorized Access and clicking ADD. The screen is shown in Figure 11.5.5. This screen sets login authentication. This is different from discovery authentication which is set in Global Configuration. Secret string Enter and confirm a password for User. Must be between 12 and 16 characters. Peer Secret string Enter and confirm the mutual secret password which must be different than the Secret. Required if Peer User is set. New authorized accesses are visible from the Sharing ‣ Block (iSCSI) ‣ Authorized Access menu. In the example shown in Figure 11.5.6, three users (test1, test2, and test3) and two groups (1 and 2) have been created, with group 1 consisting of one CHAP user and group 2 consisting of one mutual CHAP user and one CHAP user. Click an authorized access entry to display its Edit and Delete buttons. Next, create a Target by going to Sharing ‣ Block (iSCSI) ‣ Targets and clicking ADD as shown in Figure 11.5.7. A target combines a portal ID, allowed initiator ID, and an authentication method. Table 11.5.5 summarizes the settings that can be configured when creating a Target. Virtualizing a zvol adds the benefits of ZFS, such as read and write cache. Even if the client formats a device extent with a different filesystem, the data still resides on a ZFS pool and benefits from ZFS features like block checksums and snapshots. To add an extent, go to Sharing ‣ Block (iSCSI) ‣ Extents and click ADD. In the example shown in Figure 11.5.8, the device extent is using the export zvol that was previously created from the /mnt/pool1 pool. Table 11.5.6 summarizes the settings that can be configured when creating an extent. Note that file extent creation fails unless the name of the file to be created is appended to the pool or dataset name. Extent name string Enter the extent name. If the Extent size is not 0, it cannot be an existing file within the pool or dataset. Path to the extent browse button Only appears if File is selected. Browse to an existing file and use 0 as the Extent size, or browse to the pool or dataset, click Close, append the Extent Name to the path, and specify a value in Extent size. Extents cannot be created inside the jail root directory. Available space threshold string Only appears if File or a zvol is selected. When the specified percentage of free space is reached, the system issues an alert. See VAAI Threshold Warning. Read-only checkbox Set this option to prevent the initiator from initializing this LUN. New extents have been added to Sharing ‣ Block (iSCSI) ‣ Extents. The associated Serial and Network Address Authority (NAA) are shown along with the extent name. The last step is associating an extent to a target by going to Sharing ‣ Block (iSCSI) ‣ Associated Targets and clicking ADD. The screen is shown in Figure 11.5.9. Use the drop-down menus to select the existing target and extent. Click SAVE to add an entry for the LUN. Table 11.5.7 summarizes the settings that can be configured when associating targets and extents. Always associating extents to targets in a one-to-one manner is recommended, even though the web interface will allow multiple extents to be associated with the same target. Each LUN entry has Edit and Delete buttons for modifying the settings or deleting the LUN entirely. A verification popup appears when the Delete button is clicked. If an initiator has an active connection to the LUN, it is indicated in red text. Clearing the initiator connections to a LUN before deleting it is recommended. After iSCSI has been configured, remember to start the service in Services ‣ iSCSI by clicking the ⏻ (Power) button. To grow a zvol-based LUN, go to Storage ‣ Pools, click  (Options) on the zvol to be grown, then click Edit zvol. In the example shown in Figure 11.5.10, the current size of the zvol named zvol1 is 4 GiB. Enter the new size for the zvol in the Size for this zvol field and click SAVE. The new size for the zvol is immediately shown in the Used column of the Storage ‣ Pools table. The web interface does not allow reducing the size of the zvol, as doing so could result in loss of data. It also does not allow increasing the size of the zvol past 80% of the pool size. Return to Services ‣ iSCSI ‣ CONFIGURE ‣ Extents, click  (Options) on the desired file extent, then click Edit. Set the size to 0 as this causes the iSCSI target to use the new size of the file. 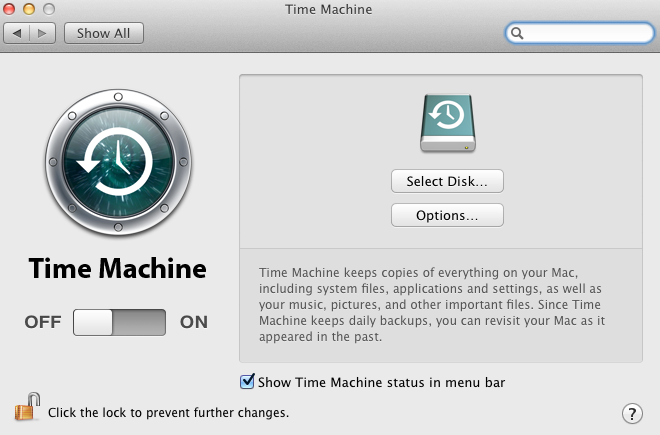 macOS includes the Time Machine feature which performs automatic backups. FreeNAS® supports Time Machine backups for both SMB and AFP shares. The process for creating an authenticated share for a user is the same as creating a Time Machine share for that user. Create Time Machine or authenticated shares on a new dataset. Change permissions on the new dataset by going to Storage ‣ Pools. Select the dataset, click  (Options), Change Permissions. User: Use the drop-down to select the desired user account. If the user does not yet exist on the FreeNAS® system, create one with Accounts ‣ Users. See users for more information. Group: Select the desired group name. 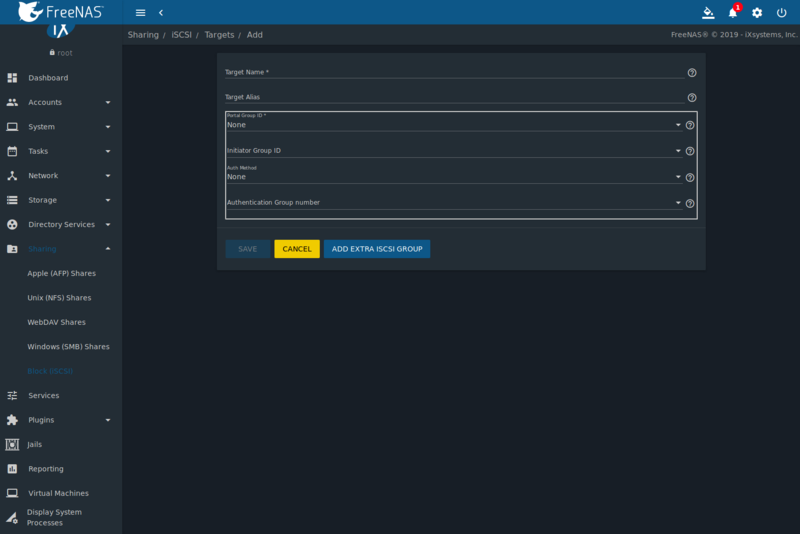 If the group does not yet exist on the FreeNAS® system, create one with Accounts ‣ Groups. See groups for more information. Go to Sharing ‣ Windows (SMB) Shares or Sharing ‣ Apple (AFP) Shares and click ADD. Apple deprecated the AFP protocol and recommends using SMB. When creating multiple authenticated or Time Machine shares, repeat this process for each user. Figure 11.6.1 shows creating a Time Machine Share in Sharing ‣ Apple (AFP) Shares. 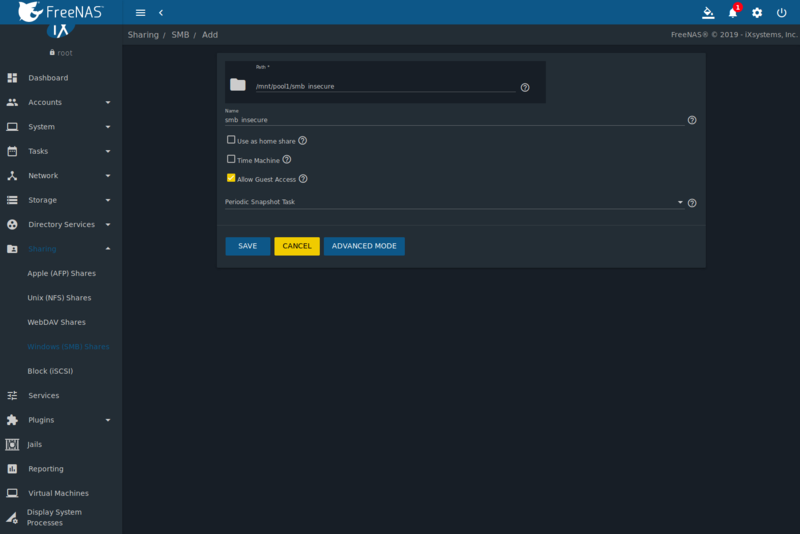 Configuring a quota for each Time Machine share helps prevent backups from using all available space on the FreeNAS® system. Time Machine waits two minutes before creating a full backup. It then creates ongoing hourly, daily, weekly, and monthly backups. The oldest backups are deleted when a Time Machine share fills up, so make sure that the quota size is large enough to hold the desired number of backups. Note that a default installation of macOS is over 20 GiB. Configure a global quota using the instructions in Set up Time Machine for multiple machines with OSX Server-Style Quotas or create individual share quotas. Go to Sharing ‣ Windows (SMB) Shares, click  (Options) on the Time Machine share, and Edit. Click Advanced Mode and enter a vfs_fruit(8) parameter in the Auxiliary Parameters. Time Machine quotas use the fruit:time machine max size parameter. For example, to set a quota of 500 GiB, enter fruit:time machine max size = 500 G.
Go to Sharing ‣ Apple (AFP) Shares, click  (Options) on the Time Machine share, and Edit. In the example shown in Figure 11.6.2, the Time Machine share name is backup_user1. Enter a value in the Time Machine Quota field, and click SAVE. In this example, the Time Machine share is restricted to 200 GiB. To configure Time Machine on the macOS client, go to System Preferences ‣ Time Machine, which opens the screen shown in Figure 11.6.3. Click ON and a pop-up menu shows the FreeNAS® system as a backup option. In this example, it is listed as backup_user1 on “freenas”. 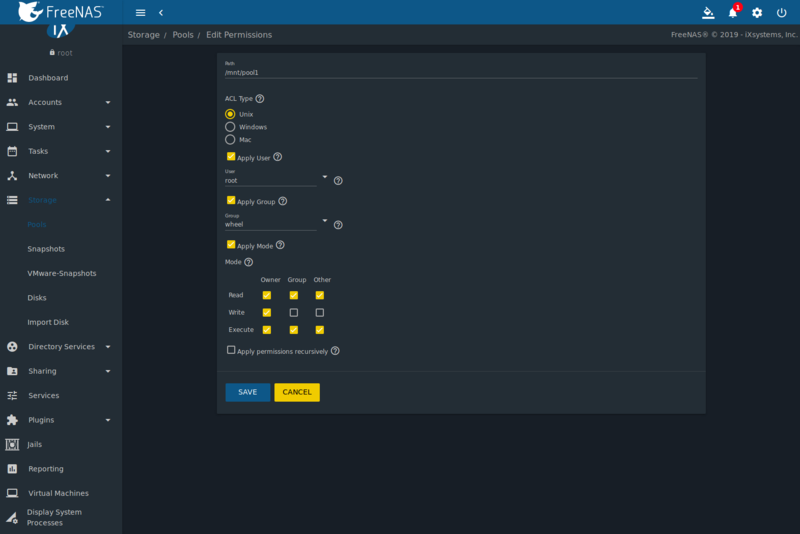 Highlight the FreeNAS® system and click Use Backup Disk. A connection bar opens and prompts for the user account’s password. In this example, the password is the password that was set for the user1 account.